One of the main functions of the Natural Resources Conservation Service (NRCS) is to perserve the intergrety of the soil and reduce the amount of erosion taking place on agricultural land. This is often accomplished through conservation practices such as no-till planting. No-till planting is where the residue from the previous crop is left on the field after harvest and the second crop is planted through the residue. This reduces the amount of disturbance of the top soil and reduces the possibility of erosion caused by rain water. 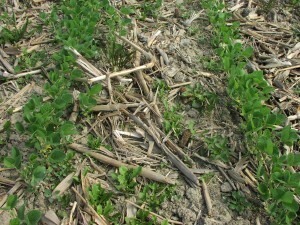 Here is an example of soybeans no-till planted in grain corn residue. 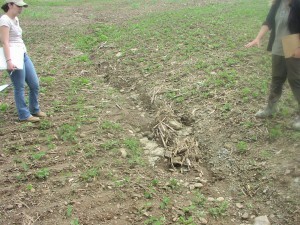 This no-till planting of crops is often applied along the contour of the slope of the hills that are present in the field to reduce the amount of soil loss. RUSLE2 is a formula developed that takes into account various pieces of information such as the type of soil in a field, the common degree of slope present, and the length of the slope where erosion is taking place or is likely to take place in the future. This computer program allows you to project such items such as the type of crops, the rotation, and the planting technique, to reduce the amount soil loss. 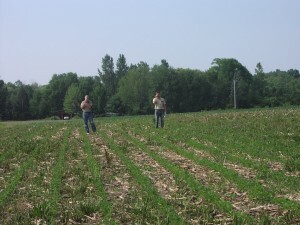 In the next picture you can see us out measuring slopes in a no-till soybean field. I think it was in the neighborhood of 100 degrees when this shot was taken. I’ll admit that I did not understand the importance of these types of activities before my internship, but as I have been exposed to the consequences of poor land management, I realize the future of our crop land is at stake. Agriculture and food production should be a top priority if we are to hope to feed the ever-increasing world population. You can’t grow food on soil that is no longer there. I have learned that what the NRCS and other soil conservation agencies do keep our agriculture land from beginning to look like the picture below and that is why I am thankful to have the opportunity to work with this agency this summer. I would never have believed that conservation work had so many facets to it. It has been an exciting and informative internship and I am looking forward to what I will learn in the few weeks that I have left. Off we go out into a marshy patch of woods where the vegetation is so thick at times that you can hardly walk and you constantly feel as if you are walking on a wet sponge. Not the sort of spot you want to go on vacation but ducks and other waterfowl would consider it the Ritz. Many tracts of land that were once havens for waterfowl have over the years been altered by agricultural practices. These former wetlands are still beautiful but yet offer a less than desirable habitat for migrating waterfowl. The Wetlands Reserve Program (WRP) is a voluntary program offering landowners the opportunity to protect, restore, and enhance wetlands on their property. The USDA Natural Resources Conservation Service (NRCS) provides technical and financial support to help landowners with their wetland restoration efforts. Our mission on this fine day was to accompany the biologist and make determinations regarding the best practices to implement which would restore this patch of woods into its original wildlife habitat. We discussed the appropriate sites for construction of small water bodies (potholes) within this tract of land would attract migrating waterfowl. As we slowly make our way through the thick underbrush we discover we are not alone. 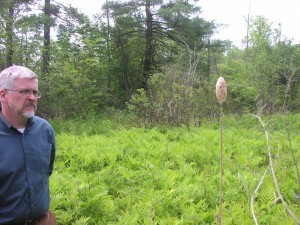 We encounter signs that one of nature’s greatest architects (beaver) calls this wooded tract its home also. 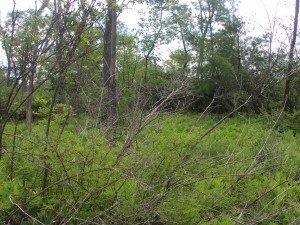 The USDA Natural Resources Conservation Service (NRCS) is often thought of as the governmental agency primarily responsible for preventing land erosion but they are just as concerned with the protection of the natural habitat of wildlife which is the driving force behind visits into these deep dark jungles. Today we went out to the field with the Conservation Biologist to examine some perspective wildlife habitat sites as part of the Wildlife Habitat Incentive Program (WHIP) administered by the USDA-(NRCS) Natural Resource Conservation Service. 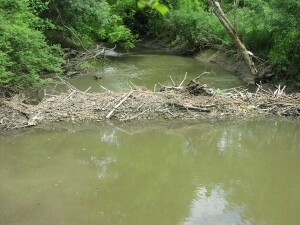 The goals of the program are to promote the restoration of declining native fish and wildlife habitats and protect at-risk species. 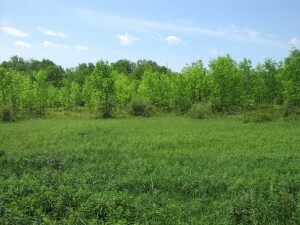 Private agricultural land may meet the requirements set by the NRCS and be eligible for cost-share funds to offset the owner’s cost of developing or improving their land to support fish and wildlife populations. 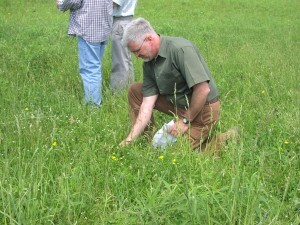 We went out to inspect the grassland sites to determine if they were suitable for meeting the primary goals of the program. We examined the existing native grasses that were present at the site and made recommendations to the land owner as to how he or she might develop or improve the quality and quantity of the cool and warm weather native grasses. It was also a great time to avail myself of the vast knowledge of the biologist and get a quick class in plant identification. We identified a number of invasive species of plants that could easily dominate these sites if not properly managed and we offered management recommendations to the land owner for controlling these problems. It was another good day in the field as I continue to expand my knowledge of the world of water and soil conservation. After a couple of days of filling out new employee paperwork at the Ithaca Field Office of the USDA-NRCS in Ithaca, New York, it’s out to the field to inspect a rotational grazing plan being implemented by a Tompkins County farmer. The 113 acre former dairy farm boards dairy heifers and young stock from surrounding dairy farms. Rotational grazing goes by many different names such as grass-based farming, management intensive grazing or prescribed grazing. The names are different but the concept is the same. 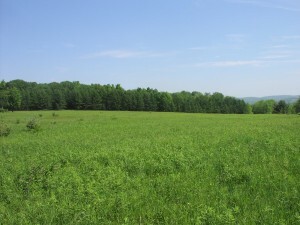 Larger pasture land is divided up into smaller, more manageable paddocks. This is often accomplished by the use of temporary fencing. Each paddock is grazed by the animals for a determined time, and then allowed to rest and recover as the animals are moved into another paddock. 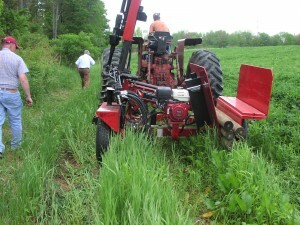 Trained grazing specialists work with farms to develop plans, recommend seedings, along with fencing and water systems. 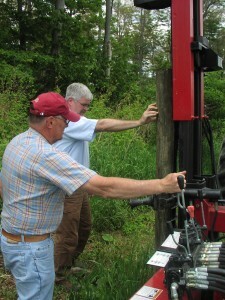 We went out as part of the (CBWI) Chesapeake Bay Water Initiative to inspect the system that the farmer was installing and confirm that it meets all the NRCS standards required for shared funding for the project. The CBWI’s main focus is the conservation and protection of the surrounding land and water that feed the Susquehanna River and ultimately the Chesapeake Bay. The farmer had many environmental concerns and was experiencing difficulties installing outer perimeter fence post due to subsurface rock. 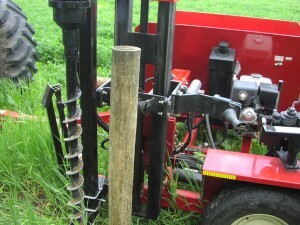 The Upper Susquehanna Coalition recently acquired a fence post driver equipped with an auger. While on site inspecting the project, we were able to assist in installing some the more difficult fence posts on the project. It was a great learning experience and a chance for collaboration with adjoining county agencies.